One of Boston's most historic and beautiful neighborhoods, Beacon Hill  is geographically demarcated by Cambridge Street to the North, Beacon Street to the South, Storrow Drive to the West, and Bowdoin Street to the East. The neighborhood is mostly residential, comprised of numerous red brick townhouses and close proximity to three of Boston's largest public spaces--the Public Gardens, the Boston Commons, and the park space that runs along the Charles river. 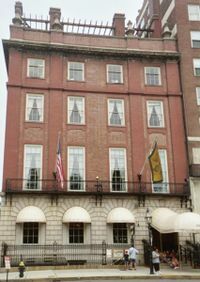 Because the Massachusetts State House is located here, "Beacon Hill" is often used as a metonym to refer to the state government or the legislature. The location of the Cheers bar, formerly Bull and Finch pub that inspired the television show. Charles-MGH (Red Line) and Bowdoin (Blue Line) stations are located at the northwest and northeast corners of the neighborhood. Park Street station (Red and Green Lines) is just to the southeast. Bowdoin Station is not open at all times: it is only open Monday through Friday from 5:15 AM to 6:30 PM, excluding holidays. Cambridge St. is accessible via the Government Center exit of Storrow Drive. In Beacon Hill it is wise to park the car and explore the neighbourhood by foot or bike. A car in Beacon Hill is unnecessary and annoying. The Hampshire House/Cheers Beacon Hill, See details under the Drink section. Charles Street is lined with numerous antique stores and boutiques. The western end of Beacon Hill, otherwise know as the "flat" of Beacon Hill, is crossed by Charles St., home to numerous antique stores, restaurants, and bars. Cambridge Street to the north is less quaint, more urban, and also home to numerous bars and restaurants. Bordering Massachusetts General Hospital, Cambridge Street in large part caters to the employees of this hospital and the large number of students and young professionals that work in this area. No.9 Park, 9 Park St. (Next to Boston Common just in front of the State House), +1 617-742-9991, . The flagship restaurant of Barbara Lynch (she also operates the B&G Oyster Co. and The Butcher Shop in South End) and one of the most acclaimed restaurant in Boston. Choose from an a la carte menu or order a multi-course tasting menu. Inside Cheers Beacon Hill. Note that the layout is not the same layout the Cheers show set used. This page was last edited on 22 March 2018, at 20:38.